« NBC and MSNBC blamed Russia for using “sophisticated microwaves” to cause “brain injuries” in U.S. “diplomats” in Cuba. The culprits were likely crickets. While gender inequality is nothing new for India, the unabashed and vehement misogyny displayed in response to a Supreme Court decision to allow women into a temple in Kerala state is notable. In this context, displays of unity and commitment to equality are not just uplifting, but also vitally important to India’s future. Last year was a watershed for gender relations. The #MeToo movement rocked establishments around the world, forcing even powerful men to face public scrutiny for their behavior toward women. 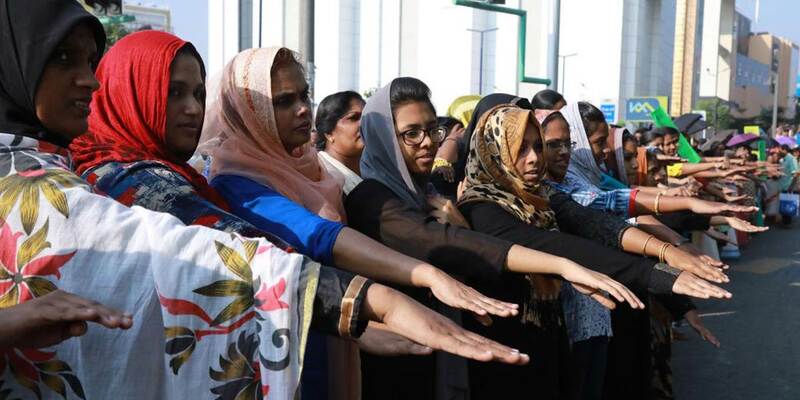 But, despite a patriarchal backlash, the movement shows no signs of abating: on January 1, in the Indian state of Kerala, an estimated five million women formed a human chain – or “women’s wall” – stretching nearly 400 miles across the length of the state, to demonstrate their commitment to the fight for gender equality. One cannot overstate the symbolic power of the women’s wall, which included more than one-third of Kerala state’s entire female population over the age of six – about two million more people that even its organizers had anticipated. The event had the backing of the state government, but it owes its success to the engagement of a variety of groups and organizations, not to mention the individual women who participated. Those women came from all strata of society. There were doctors, lawyers, teachers, students, nuns, domestic workers, agricultural laborers, wage workers, and homemakers. There were Hindus, Muslims, and Christians. There were mothers holding babies, young girls, and elderly women who could barely stand, resting on others for support. In many areas, there were also chains of the women’s male allies, standing across the road from them in solidarity. The “renaissance values” to which the women referred are those of Indian social reformers from the early twentieth century, who were committed to upholding secularism, ending gender discrimination, and eliminating casteism. The “lunatic asylum” refers to a statement made in 1892 by the Hindu revivalist monk Vivekananda, who called Kerala a “madhouse” of caste-based discrimination. Given the issue that triggered the women’s wall in the first place, it is an apt reference. Beyond serving as a condemnation of patriarchy in Kerala (and India more broadly), the women’s wall was intended as a sharp rebuke to opponents of a recent decision by India’s Supreme Court to permit women enter a much-revered temple to the god Ayyappa (Vishnu) on a hill in Sabarimala. Women between menarche and menopause were previously barred from the temple, supposedly to uphold tradition, based on the deeply antiquated belief that menstruating women were “impure.” But keeping women out of the Sabarimala temple is not actually traditional at all: women of all ages regularly entered the establishment until 1991, when a court decision banned them. This blatantly sexist prohibition amounted, the Supreme Court ruled, to a violation of the basic principles of India’s constitution. And it has much in common with the appalling “untouchability” system, whereby low-caste people have been blocked from entering temples, as well as from, say, drinking from the same water source as those of the upper castes. Yet the Supreme Court’s decision has triggered widespread protests. Both of India’s big national parties – the Bharatiya Janata Party, which controls the national government, and the Congress party – have cynically exploited this backlash, and have been accused of orchestrating violence and aggression by agitators demanding that Kerala’s government refrain from implementing the Court’s ruling. Of course, gender inequality is pervasive across India. The country ranks low in most measures of women’s empowerment, including formal labor-force participation, assets owned, and nutrition. Violence against women is rampant. In Kerala, despite high female literacy rates and strong human-development indicators, relatively few women participate in paid work. Even so, the unabashed and vehement misogyny displayed in response to the Supreme Court decision stands out. That is why displays of unity and commitment to equality like the women’s wall are not just uplifting, but also vitally important to India’s future. After a challenging year, the women’s wall stands as a potent symbol of possibility. Women will, the event made clear, lead the struggle for their own emancipation – thereby liberating all of society. This entry was posted on Monday, February 11th, 2019 at 00:03	and is filed under Uncategorized. You can follow any responses to this entry through the RSS 2.0 feed. Both comments and pings are currently closed.